Heading into today’s game, the Marlies knew they’d have to play a full 60-minutes to come out on top against a tough Charlotte opponent. A full team effort coupled with solid goaltending helped the Marlies achieve their goal and close out the weekend on a high note. Josh Jooris opened the scoring at 8:06 of the first period, knocking home his seventh of the season to give the Marlies an early lead. Frank Corrado and Carl Grundstrom had the assists on the lone goal of the frame. The Marlies outshot the Checkers 14-8 in the opening 20 and held a 1-0 lead heading into the second period. The flood gates opened in the middle frame as the Marlies posted three unanswered goals to give themselves a solid cushion. Mason Marchment set up Adam Brooks at 4:10 and he made no mistake roofing a shot past Scott Darling to make it 2-0. Trevor Moore had the secondary assist on Brooks’ eighth of the season. 18 seconds later, Chris Mueller found Jeremy Bracco coming from behind the play who tapped his 10thof the season past Darling. Stefan LeBlanc added the extra assist as the Marlies jumped out to a 3-0 lead. With 12 seconds to go in the frame, Pierre Engvall opened up some space for himself before rifling a shot top shelf to give the Marlies a 4-0 lead heading into the final frame. Sam Jardine added the fifth and final goal for the Marlies at 10:58 with a blast from the top of the circle. LeBlanc had the lone assist and finished the night with two points. Kasimir Kaskisuo stopped all 22 shots he faced earning his second shutout of the season. Josh Jooris opened the scoring at 8:06 of the first period. Jooris has 12 points (7 goals, 5 assists) in 41 games. This is his second game-winning goal. Adam Brooks scored Toronto’s second goal at 4:10 of the second period. This was his eighth goal of the season matching his career-high in 28 games. Jeremy Bracco scored at 4:28 of the second period. Bracco has five points (2 goals, 4 assists) in four games against Charlotte this season. Pierre Engvall scored at 19:48 of the second period. Engvall has two goals in consecutive games and four goals in his last five games. Sam Jardine scored his first goal as a Marlie at 10:58 of the third period. Jardine has six points (1 goal, 5 assists) in 20 games this season. Frank Corrado recorded the primary assist on Jooris’ first period goal. Corrado has four points (1 goal, 3 assists) through 29 games this season. Carl Grundstrom registered the secondary assist on Jooris’ first period goal. Grundstrom has four points (2 goals, 2 assists) in his last five games. Mason Marchment had the primary assist on Brooks’ second period goal. Toronto is 7-0-0-1 when Marchment records an assist. Marchment has 23 points (11 goals, 12 assists) through 36 games. Trevor Moore collected the secondary assist on Brooks’ second period goal. Moore has 27 points (19 goals, 8 assists) in 32 games this season. Chris Mueller registered the primary assist on Bracco’s second period goal. Mueller has 41 points (19 goals, 22 assists) through 39 games. Mueller has 29 points (13 goals, 16 assists) on the road in 20 games this season. Stefan LeBlanc had the secondary assist on Bracco’s second period goal and the lone assist on Jardine’s third period goal. Dmytro Timashov picked up the primary assist on Engvall’s second period goal. Timashov has nine assists in his last 10 games. Calle Rosen recorded the secondary assist on Engvall’s second period goal. Rosen has three points (1 goal, 2 assists) in his last two games. This was Rosen’s 100th game with the Toronto Marlies. Kasimir Kaskisuo stopped all 22 shots he faced in his second shutout of the season. Kaskisuo is now 6-6-1-0 on the season with a .874 Save Percentage and a 3.57 Goals Against Average. Toronto went 6-for-6 on the penalty kill and 0-for-6 on the power play. Toronto had a 36-21 edge in shots in all situations. Colin Greening led the Marlies with four shots on goal. Toronto’s away record is 12-5-1-2 and the team is second in the AHL in scoring on the road (93). The Marlies are 5-3-0-0 against North Division opponents and end this season’s series against the Charlotte Checkers with a record of 3-1-0-0. Toronto outscored Charlotte 14-12, winning two games in overtime and one in a shutout. The Marlies are currently on their annual Boat Show road trip, returning to Coca-Cola Coliseum on February 1. Toronto is 2-0-0-0 and have outscored their opponents 9-3. Before the All-Star Break (January 27 to January 30), Toronto will face the Charlotte Checkers twice, the Cleveland Monsters and the Belleville Senators twice. Toronto is 18-4-1-0 when scoring first. The Marlies are 14-1-1-0 when leading after the first period and 15-0-1-0 when leading after the second period. Toronto is 12-8-2-1 when outshooting their opponent. The Marlies are 3-3-1-0 in Sunday games and are 6-2-0-0 in January. Jeremy Bracco has recorded points (1-2-3) in two consecutive games. Pierre Engvall has recorded goals (2) in two consecutive games. Mason Marchment has recorded points (1-1-2) in two consecutive games. Chris Mueller has assists (2) in two consecutive games. Calle Rosen has recorded points (1-2-3) in two consecutive games. Michael Carcone (concussion) did not dress for oday’s game. He served a match penalty in the third period of Toronto’s game on January 12 against Rochester and did not return. It was close to it. The guys were consistent throughout. Once again found a way to get a good start, scored the first goal and then not look back from there. Really good way for us to finish off the weekend. I thought that they worked and put some pressure on us in the first few shifts, in the few opening minutes of the game. I thought we handled it well, kept them away from our net which was the big thing. That allowed our team to settle into the game, allowed Kas in net to settle into the game and then we just build from there. Good job keeping the puck away from our net, guys blocked shots, cleared the puck a lot better today so it was a good commitment from the group. I think they’re big, today in particular. Yesterday, I think we had a lot of confidence through the start of the game that we had, showing what we’re capable of doing but of course, they pushed back and we broke a little bit. Today we just kept playing which was nice to see. I don’t think we got the best from Charlotte. It’s been a busy week from them but at the same time, we’re focusing on our group and the guys that did a good job not giving them opportunities to gain life. Really big. I thought that was as good as we’ve seen him all year. I think a big piece of it was our guys giving him confidence and taking care of the game and keeping them away from our net. Through two periods, we didn’t give them very much at all and then we made him earn it a little bit in the third period with some breakdowns, breakaways and he was right up to the challenge and looked extremely confident doing it so that’s a really good sign for him and our team. 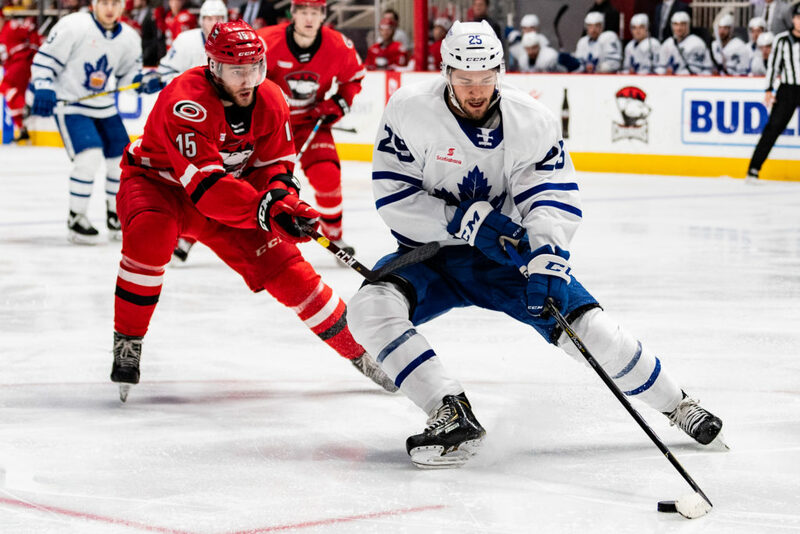 The Marlies and Checkers return to action today following an exciting Saturday night clash that saw the Marlies edge the Checkers 4-3 in overtime. After last night’s win, the Marlies improved to 20-15-3-2 on the season and 11-5-1-2 on the road. Today’s game marks the fourth and final regular season meeting between these two teams, with the Marlies holding a 2-1 lead in the season series. Both wins over the league-leading Checkers have come in overtime after the Checkers have fought back. Following yesterday’s game, Marlies head coach Sheldon Keefe spoke to the importance of playing a full 60-minutes and that will definitely be part of the focus heading into today’s matchup. In addition, the Marlies will need to play a disciplined game after taking seven penalties in last night’s game. Toronto went 6-for-7 on the penalty kill, only allowing the one goal and went 1-for-3 on the power play. The Marlies lead the AHL in power play goals scored on the road (26) and are second overall in percentage (29.2). Players to watch: Calle Rosen recorded a goal and an assist in last night’s contest. His 23 helpers this season are good for fourth in the league amongst defenceman. Jeremy Bracco also recorded a goal and an assist last night and continues to lead the league in assists with 30. Pierre Engvall notched a goal last night and now has three goals in his last four games.